Ananka's Diary: Is This Painting Cursed? 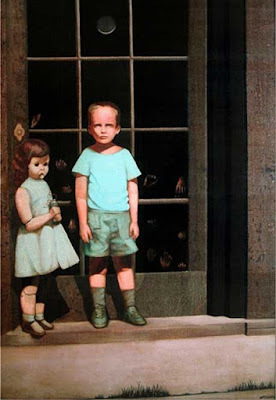 omg that is the creepiest painting i have ever seen ever!!!! and i hope that its not true that you die a yeaer after seeing it because i just looked at it!!! -shudders- Cursed or not, I wouldn't want that hanging in my house... Way to creepy for my taste. Well done, though, I must say. woah definitly cool, and spooky. And gymnast20: I think you actually have to see the painting in real life to die But if not.... We're kinda screwed. the kids dont have eyes. its too creepy to have an exclamation point. oh, and you posted about 'the bloop' some time ago. was it heard near the monterey bay? its rumored that theres a sea monster that lives in the trench in the middle of the bay. sadly, i havent seen it but im hoping to. it doesnt seem very well known but its suposed to look something like a giant sea serpent with the face of an old man or monkey with big eyes, giving it the nickname 'the old man of monterey bay'. i was wondering last night...would it be a good idea to move all my books from my closet and stack them around my room to make it look like anankas house? it would give me about 7 more shelves in my closet, it would take a while and my dad would probably make me clean my room again. also, i need to get some thin rope and wood so i can rig up my pulley hanging in my room and build a platform to be a nightstand. sorry for the long comments!! but i need opinions. Vendetta- as awesome as that would be, I don't think your parents would be so thrilled with that, lol...but I don't really get what the pulley thing is. How's the UK treating you? i'm making apple sauce today and it's so much work. but it's totally worth it because apple sauce is so good!!!!!!!! thumb biter: i think i need to comment less too. kirsten, are you going to be in the monterey bay area soon? its pretty boring around here. I can't wait for the movie to come out (any hints on when that will be?? ), but I'm not sure about Evanna Lynch...besides her accent she's a little too dreamy (at least, from what we've seen). but I LOVE Luna! evannah lynch would be pretty good. She would just have to cut her hair a bit shorter. Wear Contacts thats about it! I would love a kiki strike movie! AND I NEED TO READ KIKI 3!! the first comment posted on anankas diary was written by jin ai, who if i am correct is thumb biter. sorry if i blew your cover! and the first pic posted was a picture of a giant squid. and if any of you say i suffer from insanity, i dont suffer from it, i enjoy it. I remember the Crying Boy. This picture is creepy and, needless to say, very interesting. If you look at this picture: http://www.bbc.co.uk/derby/unexplained/2002/haunted_painting/images/ebay_haunted_painting_270.jpg and compare it to this picture: http://www.bbc.co.uk/derby/unexplained/2002/haunted_painting/images/painting_07.jpg which is the one taken at night, it's pretty clear that the "gun" is the object in the doll's hand, which the author says is a dry cell battery like he used for model planes with wires sticking out, and part of the window frame. As for the strange experiences connected with it, they could all easily be a sort of placebo effect. I'm afraid this one is probably not a paranormal phenomenon. What happens on eBay ought stay eBay. also, is it just me, or at first glance did it look like the doll was holding a gun? oh. my. glosh. I thought i would be FREAKING (sorry about my language!) FEARLESS after having a BLAST in this really creepy haunted house, but now, im just plain scared. Speaking about the haunted house, it rocked. I accidentally punched a guy in the face, (he jumped up at me, i swung my arm around, (my camera was in my hand, btw) and it must have hurt! )and they had Jack Skellington from Nightmare before Christmas there! I was, like, AMAZED, cuz i grew up with Tim Burton! Then these strobe lights went on, and he got up all in my face. I said "I love you!" and he just kinda backed off. LOL! speaking of the movie, if there is one, i could be an awesome Iris! hopefully this year i will star in my school play, i was in it last year, so i have some experience! Well, that's my long rant/comment for the day! That's, like, either a bunch of lies... or SuPeRR crEEpY!! ~What is so creepy about dolls?? They're so creepy, even though they shouldn't be. Any Ideas????? Did you know that the artist was surprised by the rumors and actually painted a sequel to it? I think both paintings are intriging looking. I'll think I could make a good kiki. I have brown hair (but could easily wear a white wig.) I'm short for my age. I can pull of black pretty well. I have pale skin and blue/green eyes. (which contacts could easily cover) I also wear contacts so I know how to put them in and out. KIKI STRIKE MOVIE ALL THE WAY BABY! HOPE KIKI 3 COMES OUT SOON!